E. Uyigue and M. Agho, Coping with climate change and environmental degradation in the Niger Delta of Southern Nigeria. Benin City: Community Research and Development Centre, 2007. M. F. Farina, Flare gas reduction: Recent global trends and policy considerations: General Electric Company, 2011. C. Elvidge, K. Baugh, B. Tuttle, A. Howard, D. Pack, and C. Milesi, "A twelve year record of national and global gas flaring volumes estimated using satellite data," Final Report to the World Bank, 2007. B. Omiyi, "Shell Nigeria corporate strategy for ending gas flaring," In A Paper Delivered at A Seminar on Gas Flaring and Poverty Alleviation in Oslo, Norway, 2001. B. Manby, The price of oil: Corporate responsibility and human rights violations in Nigeria's oil producing communities. New York: Human Rights Watch, 1999. S. Akarmazyan, "Simultaneous production of methanol and Dimethyl ether from synthesis gas," A PhD Thesis Submitted at Engineering University, Petras, Greece, 2015. The flaring of associated natural gas in Nigeria results in environmental degradation and economic wastage. Thus, several routes for monetizing this associated gas, especially Gas to Liquid processes, have been proposed and researched extensively. Amongst these, is the Gas to Dimethyl ether (GTDME) process. Dimethyl ether (DME) is a clean and economical diesel-alternative fuel which has properties that are similar to those of Liquefied Petroleum Gas (LPG) and therefore, can also be used as a fuel in power generation, home heating, and cooking. 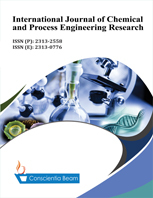 This paper evaluates the technical and economic viability of converting stranded and associated gases to Dimethyl ether via direct synthesis using associated gas from the Niger Delta region as feed, to serve as a route for the stoppage of natural gas flaring and underutilization in Nigeria. The multi-function single reactor plant was modeled with Aspen Hysys Process Simulator (version 8.6) and an economic analysis was carried out, using bare module costing, to determine the profitability of the plant, taking note of the Dimethyl ether market and price. The simulated plant produced ready-to-use Dimethyl ether with a molar purity of 97.47% and an annual revenue of $23 million at the current cost price of $0.99 per kg liquid DME; thus, proving the profitability of the Gas-To-Dimethyl ether plant in tackling the gas-flaring problem. This study is one of the very few studies which have investigated the direct conversion of associated gas to Dimethyl ether, as a way of its utilization, instead of flaring. It is geared toward provision of more components of clean fuel and environmental conservation.